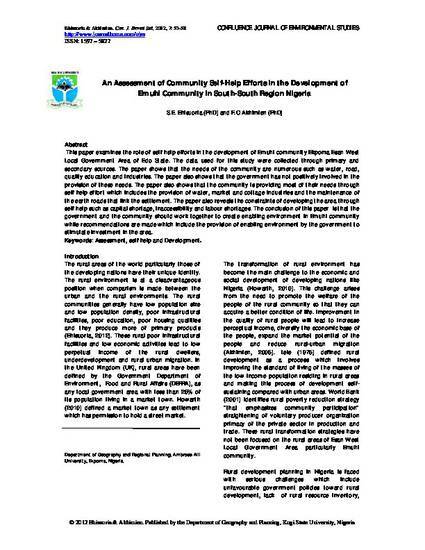 This paper examines the role of self help efforts in the development of Emuhi community Ekpoma Esan West Local Government Area of Edo State. The data used for this study were collected through primary and secondary sources. The paper shows that the needs of the community are numerous such as water, road, quality education and industries. The paper also shows that the government has not positively involved in the provision of these needs. The paper also shows that the community is providing most of their needs through self help effort which includes the provision of water, market and cottage industries and the maintenance of the earth roads that link the settlement. The paper also reveals the constraints of developing the area through self help such as capital shortage, inaccessibility and labour shortages. The conclusion of this paper is that the government and the community should work together to create enabling environment in Emuhi community while recommendations are made which include the provision of enabling environment by the government to stimulate investment in the area.